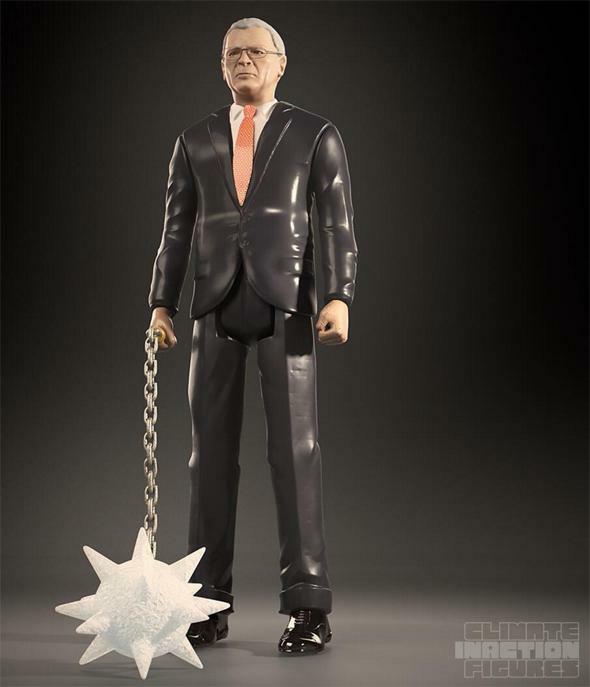 Climate Inaction Figures raise awareness of climate change deniers. Up, up, and away! No, wait, that’s the Earth’s temperature doing that. So you’re anti-reality and anti-human-driven climate change, but you can’t find any way to get your kids to listen to you about it? I have just what you need: antiheroes for the age of anti-science. 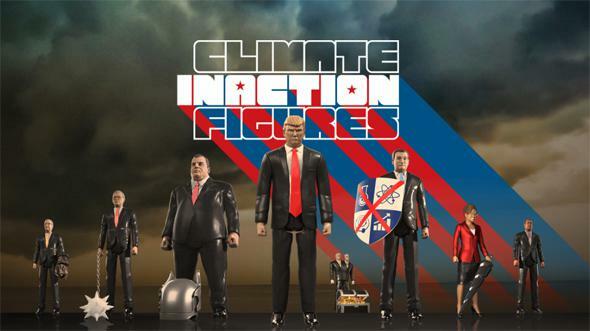 Presenting Climate Inaction Figures! Seven of the most oil-fueled deniers of science, ready to take up arms and fight against the experts, bad mouth good data, and confuse the public with verbal legerdemain! James Inhofe’s logic is a little slushy. I wonder if he’d use that on the floor of the Senate. There’s also Donald Trump, Chris Christie, and my other favorite, the two-headed Koch brothers (superpower: money. Lots and lots of money). Sadly, you can’t buy them. Unless you’re a fossil fuel company! These figures are brought to you by admen Cabot Norton and Arturo Aranda, who partnered with the Years Project—the group that made the documentary Years of Living Dangerously—to create these figures. The purpose is to raise awareness about the GOP head-in-the-sand syndrome currently scuttling any attempt to do anything about global warming. But it’s more than that: It’s an attempt to get people to understand that there is something we can do. They started the website the Climate Solution to promote the idea of putting a price on carbon, getting companies that pollute the air with carbon dioxide to pay for that pollution, and creating an incentive to reduce emissions. As former U.S. Labor Secretary Robert Reich explains in a short video, this is the same idea that was behind reducing acid rain due to pollution; companies were forced to pay for that pollution and in a few years the problem was greatly reduced. Fossil fuel companies complain about a “carbon tax” now as they did for the acid rain tax then, but in the end it worked out pretty well. A carbon tax will force these companies to look into more efficient renewable energy production, as well they should. It’s not that easy, of course, but the problem right now is really the Climate Inaction Team. They won’t even allow it to be discussed, and if we can’t get our politicians to at least talk about it, we can be sure it’ll never happen. So remember that come November. While the world gets ever-hotter, and the U.S. bakes under a massive heat wave, it’s way past time that the folks who get burned are the ones denying it’s even happening. Vote ’em out of office. You can follow the Climate Inaction Figures on Facebook, Twitter, Instagram, and Tumblr.